Yesterday i finished the controller board prototype for the new NanoQuad i’m building. In this first phase i’ll control it using a DSM2 compatible Six channel radio from HobbyKing. The gyro is simply a WiiMotion+ board. 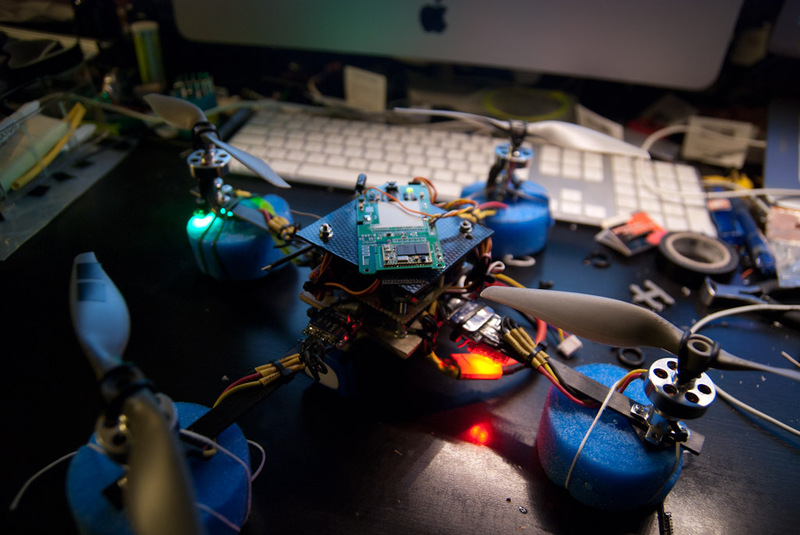 The bluetooth radio will connect wirelessy the nanoquad to a controller board that contains an lcd, an atmega8, a bluetooth module and a port for an wii classic controller to be used to drive the quad. The lcd will make able to change parameters and for a simple “telemetry”. Here are some pictures (unfortunately i missed the finished controller board alone). I was waiting for my props (they had an odyssey thanks to Poste Italiane, a long story worth a whole post…), than i saw an old bluetooth GPS, useless nowadays. Than i ripped apart the GPS(hopefully it will be used in the quad someday), modded a little and attached to the Quad Arduino. I only had to change the MultiWii firmware to slow down serial speed to 32800 (I haven’t found documentation of the module to change the speed). In some days i should receive a new module bought from Ebay( Sure Electronic) that’s able to support 115200, that i will integrate into the main board. Now I can use the MultiWII interface for short range remote telemetry on the quad, very useful for setup the PID. 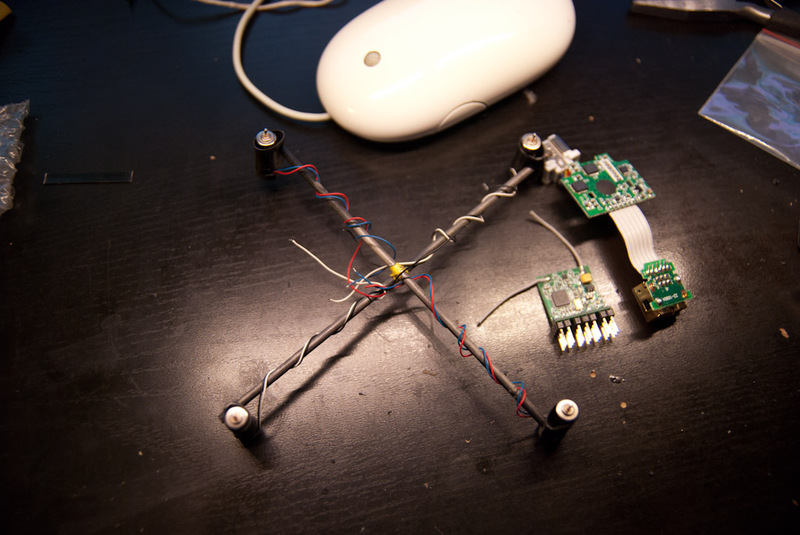 In this post i’ll show the new version of the quadricopter I’m building. Actual frame is built with 4 12x2mm Carbon fiber arms, joint in the middle with a 70x70x4mm birch wood multistrate plate. it has a dry weight (without battery) of around 350gm with props installed. Previously the frame was a cross made from 8x8mm Alu U profile. No need to say that after a long list of crashes (this was the first flying thing I flew) at the end it gived up.